Desensitized explosives such as those wetted with sufficient water, alcohol, or plasticizer to suppress explosive properties. Self-reactive materials that are thermally unstable and that can undergo a strongly exothermic (heat-evolving) decomposition even without the participation of oxygen (air). Certain exclusions apply. Solids which may cause a fire through friction, such as matches. Pyrophoric (literally, "fire-loving") materials, those that can ignite with no external ignition source within five minutes after coming in contact with air. Dangerous when wet materials, those that react with water to become spontaneously flammable or to give off flammable gas or toxic gas at a rate greater than 1 liter per kilogram of the material, per hour. Because of the special hazards posed by flammable solids (and other dangerous goods), shipment of these materials can be difficult. For example, the US Postal Service will not accept shipments of flammable solids by air, and will only ship these by ground subject to certain restrictions. Likewise, United Parcel Service requires the shipper to be HazMat-certified and has limitations on quantities. All carriers, including FedEx, have special handling fees for such shipments. Get your Class D extinguishers from Safety Emporium. 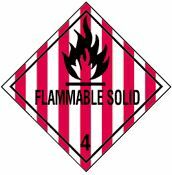 Always use caution around flammable (or potentially flammable solids). For example, most people do not normally think of aluminum metal as a flammable solid, but when finally divided into dust (or heated to high temperature) it can readily ignite with a fierce flame. If you are using flammable metals (lithium, sodium, potassium etc.) or flammable metal compounds (butyllithium, diethylzinc etc.) recognize that using water or carbon dioxide fire extinguishers can fuel fires of these sorts. You must have a class D extinguisher on hand if you are using these materials. See this reference for details. The shipping label/placard shown above is required under 49 CFR 172.420. Definitions and Examples of Flammable Solids (PDF document) at Penn State University. The Oregon State Fire Code has detailed information (PDF) on the storage and use of flammable solids, particularly magnesium metal. Hazardous Materials: Flammable Solids Safe Handling Guidelines (PDF file) at Stanford University's Linear Accelerator Laboratory. Hey, they reference us! See also: combustible, flammable, flash point, water reactive.